COLORADO SPRINGS, Colo., Feb. 7, 2019 /Christian Newswire/ -- As organizers of the International Day for the Unreached (www.dayfortheunreached.org) prepare for the fourth annual event on Sunday, June 9, they are celebrating a big step forward in the goal of seeing the Gospel of Jesus spread to every corner of the globe, and making an "all hands on deck" appeal to focus on and reach those who have yet to hear the gospel. 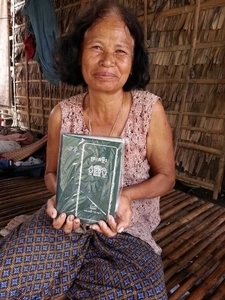 Photo: A Cambodian woman receives a Bible after participating in a local ministry's literacy program. In December, leaders in the missions community met at the Finishing the Task conference in California to report on progress in sharing the gospel with the world's two billion unreached. Attendees committed to reaching the last people groups with no one currently focused on evangelizing them. "I'm excited to see the engagement level of churches and ministry organizations increasing," said conference participant Larry D. Andrews, President and CEO of Partners International, one of the members of the Alliance for the Unreached, a network of like-minded missions organizations. "It was a significant moment, but there is still much to be done to fully achieve the mission Jesus has for us," Andrews added. "We need all hands on deck. It is going to require every church and every individual Christ follower to play their part in helping us accomplish the Great Commission of Jesus Christ." The Alliance for the Unreached is supporting that effort by focusing attention on the needs of all those who have yet to hear the gospel, and spotlighting the ways different organizations are trying to reach them and how individual Christians can get involved. Central to the group's initiative is the annual global observance of the International Day for the Unreached, to be held on Pentecost Sunday, June 9. The day is chosen because it marks when the Holy Spirit fell on the early church, empowering the disciples to fulfill the Great Commission. The International Day for the Unreached will feature a globally streamed live celebration and challenge for which organizers hope to see 100,000 participants. Millions of people have learned about the Alliance's initiative through social media, over the last three years. Meanwhile, the Alliance has also produced a new Great Commission Action Guide intended to encourage year-round engagement in the task. It tells individuals and churches how they can help and get others involved through prayer, advocacy, sharing and service. "As important as the International Day for the Unreached is, an event is not going to be enough on its own," said Andrews. "Jesus did not just call us to be aware of the Great Commission and the challenge to reach all the peoples of the earth – he called us to personally engage." Comprising 14 similarly-focused but diverse organizations, the Alliance reflects the wide range of needs and opportunities in sharing the gospel with the unreached. Founding members include those involved in Bible translation and distribution, broadcasting, children's ministry, church planting, relief and development, and medical help. The Alliance members are: Bibles For The World, DOOR International, FEBC (Far East Broadcasting Company), Frontier Ventures, Joshua Project, Mission Network News, Missio Nexus, Operation Mobilization, Partners International, Reach Beyond, Seed Company, TWR (Trans World Radio), World Mission and ZimZam Global. The Great Commission Action Guide is among the Alliance for the Unreached resources available at dayfortheunreached.org. The International Day for the Unreached (www.dayfortheunreached.org) is an initiative of the Alliance for the Unreached, a group of evangelistic ministries and other organizations: Bibles For The World (www.biblesfortheworld.org), DOOR International (www.doorinternational.org), FEBC (Far East Broadcasting Company, www.febc.org), Frontier Ventures (www.frontierventures.org), Joshua Project (www.joshuaproject.org), Mission Network News (www.mnnonline.org), Missio Nexus (www.missionexus.org), Operation Mobilization (www.omusa.org), Partners International (www.partnersintl.org), Reach Beyond (www.reachbeyond.org), Seed Company (www.seedcompany.com), TTWR (Trans World Radio, www.twr.org), World Mission (www.worldmission.cc), and ZimZam Global (www.zimzamglobal.org). For more information, contact Gregg Wooding (InChrist Communications) @ 972-567-7660 or gwooding@inchristcommunications.com.